Woolworths has introduced 24 new products in its Woolworths Free From and Macro Wholefood Market range. With the launch of their new products Woolworths aims to cater for the increasingly growing number of Australians living with dietary needs or who choose to be more health conscious. Woolworths Free From Gluten Waffle Cones and Arrowroot Biscuits* which can be found in the Health Food Aisle from late March. Woolworths Free From Gluten and Dairy Free Chocolate Cheesecake, Blueberry Muffins, Anzac Biscuits, Chocolate Cake and Apple Pie, all in-store now, found in the bakery department. The new products being added to the existing Macro Wholefoods Market range span from organic fresh produce to healthier snacks which claim to have no artificial colours, flavours or sweeteners and no hydrogenated oils. Woolworths Senior Nutritionist, Natalie Chong said; “Woolworths is committed to offering our customers great choice, including those with different dietary requirements, so we’re excited to be introducing a new range of products across our Macro Wholefoods and Free From range. “Awareness of coeliac disease is growing so we are continuing to work towards expanding our Free From range across various areas of our store to meet the shopping needs of our customers. “The new products in the ​Macro Wholefoods Market range are designed to give our customers more opportunities to make healthier choices. From delicious kids snack ball varieties, to vegetable powders, there’s something for everyone in the Macro range. We have also expanded our Macro Organics range to include versatile ingredients like coconut flour and coconut sugar,” Chong said. 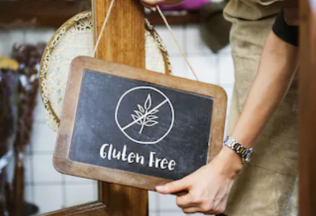 A Melbourne café is the first completely gluten free café to be accredited by Coeliac Australia.